This recipe is one of my husbands ultimate favourites (although he says that about a few recipes I cook!) Its so easy to make and is a great accompaniment to most dishes. I cannot take any credit for this as I haven’t added in any new ingredients (just tweaked it a little). I came across it in the Essentials magazine and it was titled ‘Smashed Summer Spuds’. 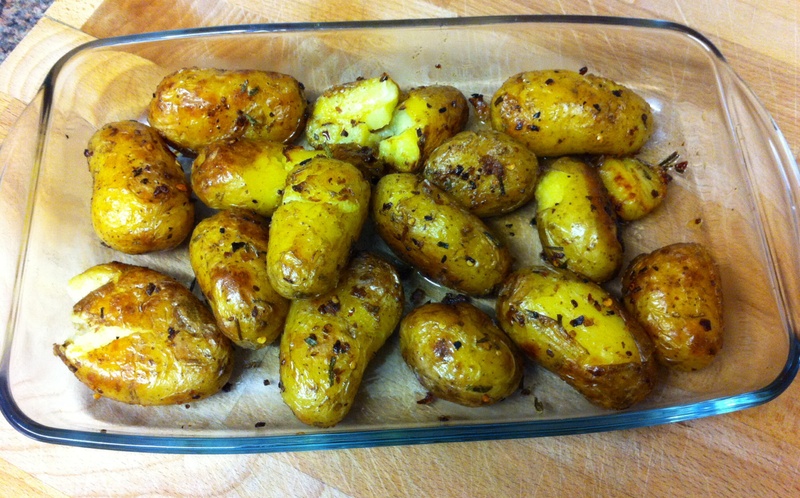 The recipe calls for jersey or new potatoes but you can use normal roasting potatoes like you would to make roasters. If you don’t have any jersey royals or new potatoes use roasting potatoes, peel and cut into small pieces the same size as jersey royals. This will effectively make them rotated potatoes but with the spices and garlic added it should make a nice change to normal roasties. If you don’t like spicy food don’t be put off using the chilli flakes, just be sure to only add a little sprinkle. You may want to try sprinkling with small pieces of bacon or dried onion bits. You would need to cook the bacon and sprinkle over just before serving as the high oven temperature will cause the bacon to cook hard. Again, sprinkle onion bits just before serving. Cooking times can vary and it also depends on how crunchy you like your potatoes. The original recipe cooks for 20-30 minutes however I usually cook mine for 35-40 minutes. I find it helps to have the tray high up in the oven in the last 10 minutes in order to brown the potatoes. For a more cheeky taste you can use goose fat instead of cooking oil although this will add a few calories! 1. Heat oven 220′ or gas mark 7. In a pan cover the potatoes with boiled water and cook for 12-15 minutes or until tender. 2. In a baking tray add oil, crushed garlic, celery salt, chilli flakes and chopped rosemary. When the potatoes are ready, drain and tip into the tray. 3. Using a spoon, mix the ingredients so that each potato is covered. Then using a fork gently tap and press on the potatoes ‘smashing’ and crushing them. I am assuming that the diet change is due to your Myalgic Encephalopathy. I hope it is helping. My daughter would be devastated if she had to give up potatoes. On her last visit home I decided to play a joke on her by making a meal consisting of all things potato; mashed, roasted, chips, potato waffles, croquettes etc. She loved it! My daughter is a strange girl. Yes, my diet change is to do with my ME, its been just over 2 weeks now and I can honestly say that I’m starting to notice a difference which is good. I am a little sad to give up so many great foods, but I have to stay positive and be hopeful that when I improve, I will be able to reintroduce small amounts of these foods again. I must admit, christmas wont be the same without roast potatoes, my sister makes them just perfect all roasted in goose fat! I must say, I like your sense of humour, haha! A meal full of potatoes sounds epic! Your daughter isn’t strange (bless her!) she just really loves potatoes! Good recipe and sounds it will be tasty. My daughter loves potatoes so I will need to try this recipe when she comes home from university. I hope your daughter enjoys them too. I’m currently on a special diet (long story) so can’t have potatoes, but before the diet, smashed spuds were usually on my plate every other day! !